Gilberte Interiors has an in-house, 2,000-square-foot workroom with master craftsmen on staff. Our ability to create and finish your furnishings in-house allows us to oversee the fine detail and quality of your projects. 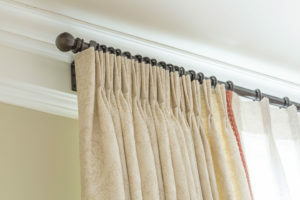 From window treatments to slipcovers, bedding, upholstery, and technical hardware, let our knowledgeable craftsmen create an exceptional finished product for you. In addition to delivery and professional installation, we also oversee the tradesmen on your projects. Our positive attitude and interest in getting the job done right the first time are hallmarks of Gilberte Interiors. We want to be confident that each project is completed to both our satisfaction and, most importantly, to yours. We have found that this final step allows our clients to enjoy the process without the stress of overseeing the deliveries and installations. Our qualified master installers boast years of experience and make the final steps of your project seamless and relaxing by working alongside your design team. No matter the size or scope of the project, you can expect the same level of preparation, cleanliness, and expertise Gilberte Interiors is known for.